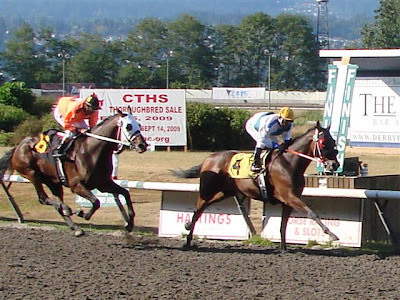 the Hastings Race course in Vancouver. 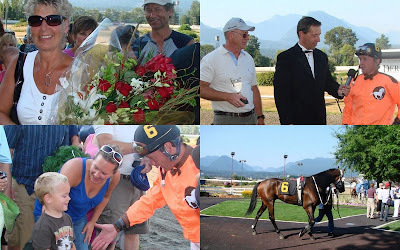 Krazy Koffee was entered in the $100,000 BC Cup Redekop Classic. 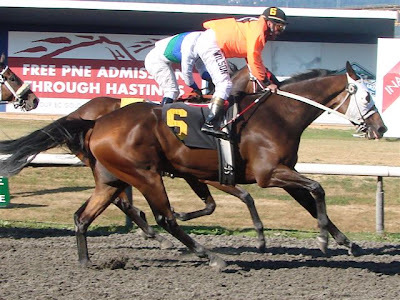 hit the jackpot with his first race horse, Krazy Koffee. with a purse of $250,000 plus bonuses. This year we've all been carefully tracking the results. 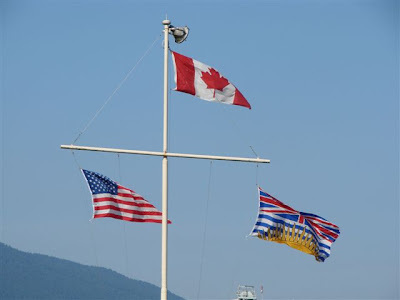 and what better thing to do, than cheer there success on BC Day! Krazy Koffee is getting warmed up on the paddock. 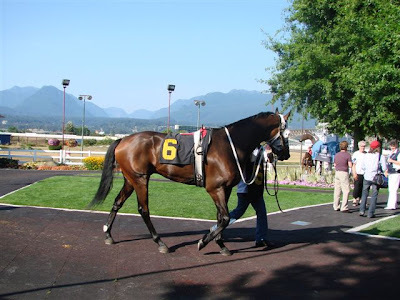 He's been lined up for the BC Cup in the 9th Race of the day. as you know there are always winners and losers. and sure enough, he overtook the second place horse and won. On to the finish line he gallops, by one head's length. And there is a crowd cheering loudly once again. Krazy Koffee good to last trot. 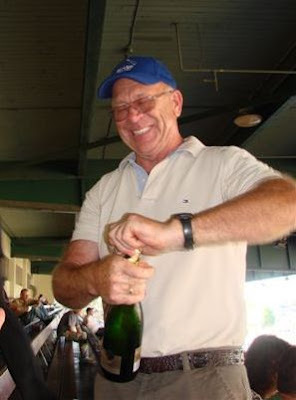 and shares generously with all his family, friends and supporters. and 4 year old grandson Baylor receives the jockey's goggles. Another BC Day to remember. Once again, Congratulations, Butch & Renata! PS. Thank-you to L F for sharing her photos. I see Butch's & Renata making hay! I ran over, and suggesed a cup of coffee and fresh Zucchini loaf. while watching my husband work." at the race tracks, but winning against the weather is also important. Another day, another dollar, business as usual. picking and sorting through the last of the Transparents. Many yummy pies and applesauce galore. You know what I'll be doing in the next few days. Krazy name - but it works! I thought you were going to talk about a coffee place. I admire the work ethic of you farmers...you did not get there for nothing...if you know what I mean. We are reading this together...while we are having morning coffee...and send our congrats to Butch & Renate on another big win! Thanks to Linda for sharing her pic's...she is never without a camera. Now that theOnly on the mainlan hay is in...let it rain! (only on the mainland though). Can I get your zuchinni loaf recipe??!! What a beautiful setting for a fun day. Your neighbor is lucky to have a thoughtful friend (you)to share things with. That is pretty interesting that you also have pillows similar to mine. That apple green color is so pleasant to look at, I guess it just calls out to us. Good neighbours make good feelings, don't they?